Villa Wang Nam Jai is a luxury rental villa nestled in the quiet oceanfront located at Kamala where west coast in Phuket. Around the villa also have other villas Villa Minh, Villa Torcello but there are a screen of tropical trees afforded privacy each other. Villa could open 1 to 4 bedroom following number of the guest stay. 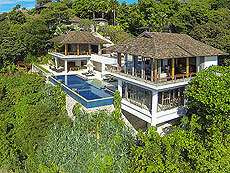 The villa is only 40 minutes ride from Phuket airport and 20 minutes to Patong beach where famous spot in Phuket.